Dental crowns can be made from a number of different materials each with distinct qualities that affect the durability and price of the permanent crown. Ceramic & Porcelain Crowns: Porcelain & Ceramic crowns are popular for their natural looking esthetic and are commonly used for teeth towards the front of the mouth. The main disadvantage of these crowns is that they are not as durable as all metal or porcelain-metal hybrid crowns. These crowns are also more expensive than their gold or metal crown counterparts. 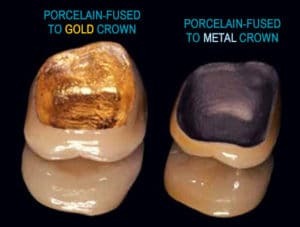 Porcelain-Fused to Metal Crowns: This type of crown maintains a natural look with sturdy, metal construction underneath. It is a middle ground between all metal & all porcelain crowns that is very durable & visually pleasing. Disadvantages of this crown type are that: porcelain can still fracture or chip, porcelain crowns can wear down teeth they come into contact with, and the underlying metal portion of the crown can become exposed with gum recession. Gold Crowns: Other than the unnatural cosmetic appearance, Gold crowns are the most durable and don’t wear down opposing teeth. Besides the color, some patients have allergies to metals that are used in Gold & alloy crowns. Metal Alloy Crowns: Alloy crowns are typically constructed using a mixture of noble and non-noble metals. High Noble Alloy Crowns contain more than 60% noble metals in their mixture, of which at least 40% has to be gold. Palladium, gold, and platinum are the noble metals used for dental crowns, and the more used, the higher the cost and durability of the resulting crown. Noble Alloy Crowns contain over 25% noble metals that are mixed with small amounts of Tin, Indium, Gallium, Ruthenium, Cobalt and others. Non-Noble Alloy Crowns contain less than 25% noble metals and instead use large amounts of Nickel, Cobalt, Chromium or Beryllium & more in their mixture. Composite Resin Crowns: Resin crowns are usually the most affordable type of crown available, but they are also less durable and more vulnerable to cracking & fractures because of the materials used. Crowns comprised purely of resin are quite natural looking and provide a less expensive option when putting a cap on a tooth is necessary. Stainless Steel Crowns: Steel crowns are often used as a temporary measure while a more permanent crown is made. Since the precise construction of your permanent crown may take a couple of days to complete in our lab, we offer these crowns as a temporary solution to any patient who is having a crown built by our dental ceramics expert. The “best” type of dental crown for each situation depends on the the location of the tooth, visual preference of the patient, and the cost of the materials used for the dental crown. Gold & metal alloy crowns are by the far the most durable and offer the best solution if cosmetic appearance or cost are not an issue. Porcelain crowns look like natural teeth, but can aggravate opposing teeth and are less hardy. On the other hand, porcelain-fused to metal crowns offer the best of both worlds with a visually appealing outer shell supported by a durable metal substructure. If none of these crown options are appealing, then there are always composite resin crowns which cost a fraction of the others, but you get what you pay for. Our dentists at Carson & Carson, DDS have over 45 years of experience working with dental crowns. Over the years, we have restored the function to thousands of teeth using the various types of dental crowns shown here. When it comes to something that is going to be in your mouth for the rest of your life, why settle for anything less than the best? Get a same day crown built TODAY & enjoy the benefits of a brighter smile tomorrow.